So, I Google Image searched “cute college football coaches”, and the first picture to come up was Joe Paterno (google search results). So I would have to disagree with my esteemed colleagues’ assessment that we have been lacking in cuteness within out football department. However, since I must pick a new head coach, I am going with Frank Cignetti, Jr. Who is this man? Well, he is currently the Offensive Coordinator for the State University of New Jersey (aka Rutgers). Look at those eyes - so kind. And that smile - trustworthy! Coach Hottie is not just looks alone (though that is clearly reason enough to allow this man to walk the sidelines). Cignetti has great college football experience - offensive coordinator at Fresno State back when Fresno State was racking up 50 points a game. 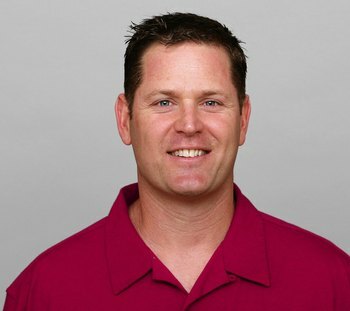 He also has experience at the NFL level with the New Orleans Saints and Kansas City Chiefs. Plus we know he is going to age well as Dad (Frank Cignetti Sr) has aged well. Coach Hottie also has a good Pennsylvania ties, coming from Pittsburgh (you know that is a HUGE selling point for me) and a graduate of Indiana University of Pennsylvania - great football powerhouse that is. No, seriously, IUP is pretty good in football. Let the Board of Trustees know you want Coach Hottie - aka Frank Cignetti, Jr - as the next head football coach of our Nittany Lions! !